For a while now I have been trying to find a good workflow for manipulating depth of field in Max. I recently stumbled upon one that I feel is very useful for giving the user maximum control over his/her output. It provides more flexibility than just relying upon a flat Depth elements pass and it also fixes a few issues I was personally having with rendering out correct particles. Usually in Max to get Z Depth pass, you would render through the elements tab found in the (F10) render set up tab seen below. This is also the practice that up until recently I have been using. Recently however, I have been integrating more animation work into my workflow and with that comes a reliance upon flexibility and feedback. Rendering out to the elements tab of a render often pushes passes into a secondary priority and something that you do to supplement perhaps the beauty pass, or another process. It also means that a lot of the time you are left waiting for the Z Depth pass due to the rendering time needed for the primary image. What I have taken to doing instead is making the Z Depth a primary pass. Doing it in this way ensure that it not only renders a lot faster, but that you also have maximum control over it. To do this I have applied a standard material across the entire scene with a distance blend falloff in the diffuse and self illumination slots of the material (Shown below). – You can animate both the min and max distances. – You can edit the curves for the material. 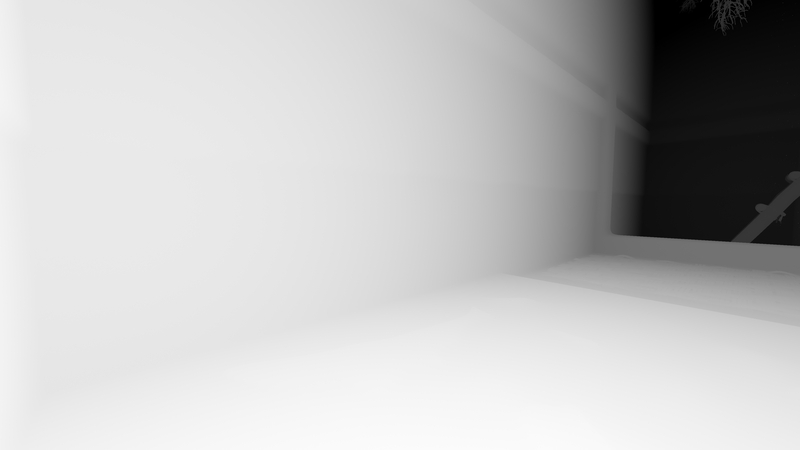 – Sometimes the render elements ZDepth pass can cause issues with particles. – Very quick and provides just the Z Depth output.